As one of the founding members of the STAR Alliance, Air Canada was one of the first airlines to paint an aircraft in a special STAR Alliance color scheme. 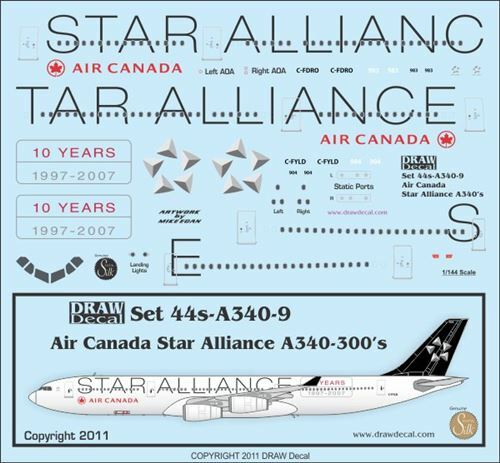 This set depicts the later and current STAR ALLIANCE scheme. Two Airbus A340-300s have worn this current scheme at Air Canada - C-FYLD and C-FDRO. This set will letter either aircraft, and is designed for the Revell A340-300 kit in 1:144 scale.